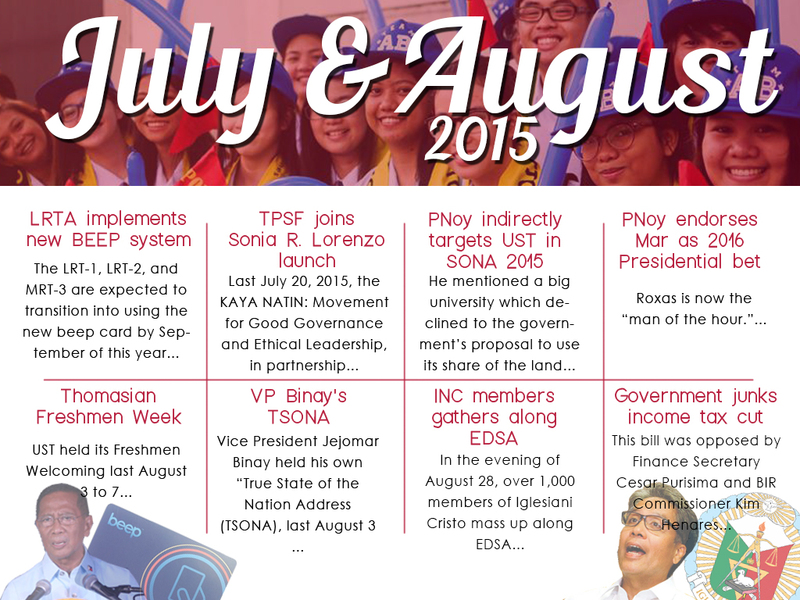 Last July 20, 2015, the KAYA NATIN: Movement for Good Governance and Ethical Leadership, in partnership with the University of Santo Tomas Graduate School and The Political Science Forum, officially launched the First Sonia R. Lorenzo Award at Thomas Aquinas Research Complex Auditorium in commemoration of the first death anniversary of former mayor of San Isidro, Nueva Ecija – the late Sonia R. Lorenzo. The Sonia R. Lorenzo Award recognizes the commendable women leaders who embody effective, empowering, ethical leadership, and good governance. The LRT-1, LRT-2, and MRT-3 are expected to transition into using the new beep card by September of this year. The Light Railway Transit Authority conducted a public trial of its tap-and-load card – also known as beep card – last July 20, 2015. According to Hernando Cabrera, LRTA Spokesperson, the public trial of the Automated Fare Collection System or the unified ticketing system will have its pilot testing at the LRT2 Legarda station located in Sampaloc, Manila. A stored value card could be loaded up to Php 10, 000 and it does not have an expiration date. This new ticketing system is being implemented to allow faster access to all three (3) railway lines of the metro – LRT-1, LRT-2, and MRT-3. Roxas is now the “man of the hour.” Former Department of Interior and Local Government Secretary Mar Roxaswas recently endorsed by President Aquino and now the standard bearer of the Liberal Party. Roxas had already expressed his interests prior to Aquino’s most awaited endorsement. The endorsement by the incumbent president is a big deal for presidential hopeful Roxas as he is confident that he will receive comparable support from those who voted Aquino last 2010 Presidential elections. ​Days after President Aquino’s speech to the citizens of the state, Vice President Jejomar Binay held his own, calling it the “True State of the Nation Address (TSONA), last August 3 in Cavite State University in Indang. He enumerated the four fallen places where lives should have been saved: Luneta, Tacloban, Zamboanga, Mamasapano; and three acronyms that showed Aquino’s failure: the MRT, DAP, and BBL. He also tackled about the economy, saying (that) the progress the country had been experiencing only benefitted the few. Throughout his speech he kept commending the great service the SAF (Special Action Force) 44 did for the country. Rizalito David is one among those who challenged the citizenship and residency of Sen. Grace Poe in order to unseat her from the Senate. He argued that Sen. Poe has no right to remain in office due to her lack of residency in the Philippines when she filed her certificate of candidacy last 2013 for the Senatorial Elections. She should be ineligible to file her COC in the first place due to the said issue. Moreover, Sen. Poe’s citizenship was also questioned. David claims that Poe was a foundling, hence there were no actual basis on how she obtained her Filipino citizenship. David, quoting the 1987 constitution, which says “no person shall be a Senator unless he is a natural-born citizen of the Philippines.” Both of the issues were disregarded by Poe and her confidence remains that she will be able to provide satisfactory evidence that she is indeed a natural born Filipino citizen and has resided in the country enough for her to be qualified for the position. ​The Jessie Robredo Foundation, in partnership with the UST Political Science Department, spearheaded the “Tsinelas Leadership Forum: How it can change the Philippines” held at the UST Miguel de Benavides Library Conference Hall last August 18, 2015 to commemorate the third death anniversary of Secretary Jessie M. Robredo. Key speakers were Fatima Girlie Lorenzo from the Kythe Foundation, Senator Francis “Kiko” Pangilinan, and Atty. Arnel Casanova from the Philippine Bases Conversion and Development Authority. They tackled how responsible leadership, good governance, active participation can become ingredients to transform the Philippines. In the evening of August 28, over 1,000 members of Iglesiani Cristo mass up along EDSA corner Shaw Boulevard. INC members are joining the cause because they wanted the government to respect the separation of church and state; the DOJ should not intervene with the internal affairs of INC. The mass protest which lasted for almost four days caused severe traffic both on the north and south bound lanes of EDSA. The INC members ended the protest peacefully in EDSA on August 31 due to the orders of INC Evangelist Bienvenido C. Santiago. Protesters in front of DOJ have likewise ended their protest as soon as they received the announcement of their INC leader. The House Bill No. 4829 or Tax Reform for Inclusive Growth authored by Marikina Representative Miro Quiambao seeks to reform income taxes imposed on individuals and corporations. It aims to change their existing income tax brackets according to inflation and to simplify the tax structure to lessen the burden of taxpayers. However, this bill was opposed by Finance Secretary Cesar Purisima and BIR Commissioner Kim Henares. The Malacañang, is also in favor of the current tax rates, which means the government will not bend on lowering the taxes because the robust economy cannot be put to risk.